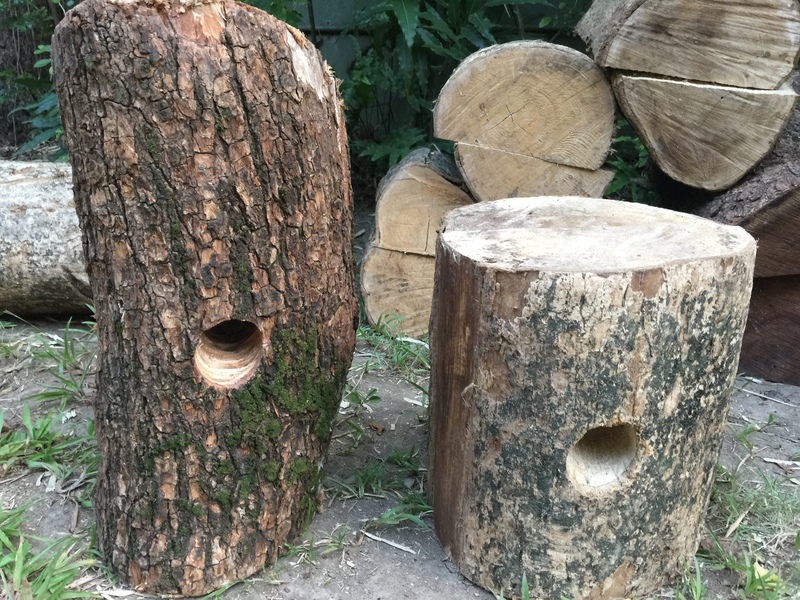 Why do birds need artificial nest boxes and why are we making them? 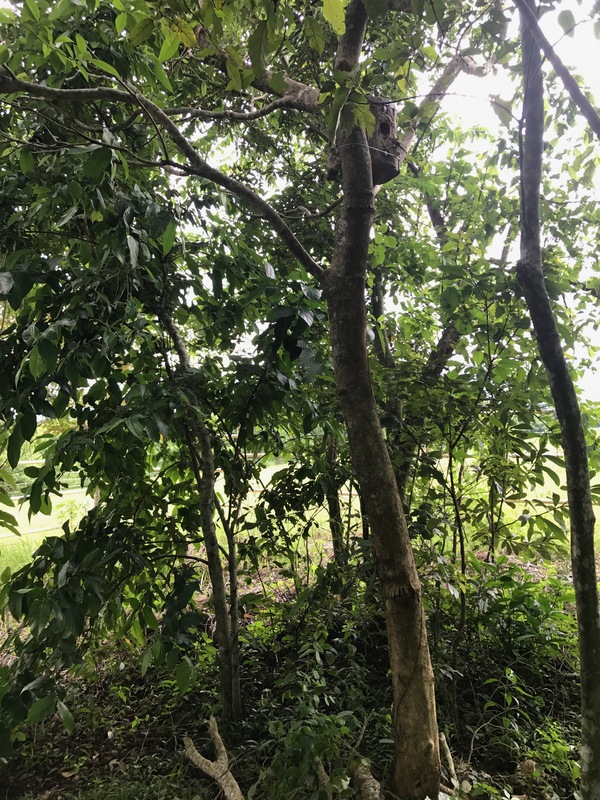 There are birds in the farm that nest in naturally occurring tree cavities. These are usually holes on the trunks of old and mature trees. When a branch breaks off from a tree, maybe from strong wind during a storm, the broken off part starts to rot. The soft, rotten parts attract insects and cavity-building birds like woodpeckers. Woodpeckers use their strong beaks to expand the cavities. Later on, when the cavity-building bird like the woodpecker moves on to another tree, other birds move into the cavity that the woodpecker created. Birds like owls cannot build their own cavities. They use the cavities that were built by other species. Studies have shown that oftentimes the lack of available nesting sites is the only thing that prevents certain bird species from breeding. In our place, we can see that we don’t have a lot of suitable nesting sites for owls and other cavity-nesting birds. We have very few mature trees. A few years back, our caretaker even reported seeing a Scops Owl nesting on the ground! We hope that the Scops Owls that we hear in our area nest in our new artificial nest boxes. 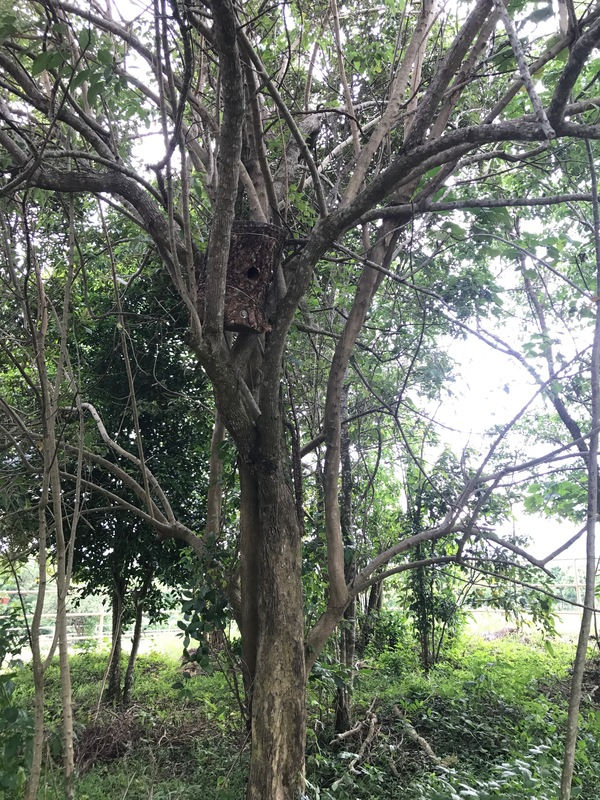 How do you make a nest box suitable for the tropics? Our main considerations were making the nest boxes durable and heat-proof. 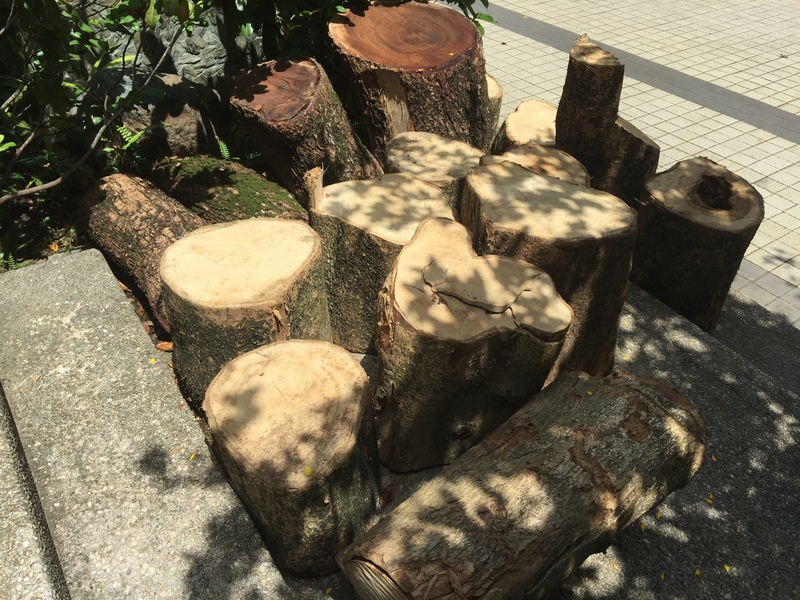 We came upon big pieces of tree trunks from felled trees in our city neighborhood. 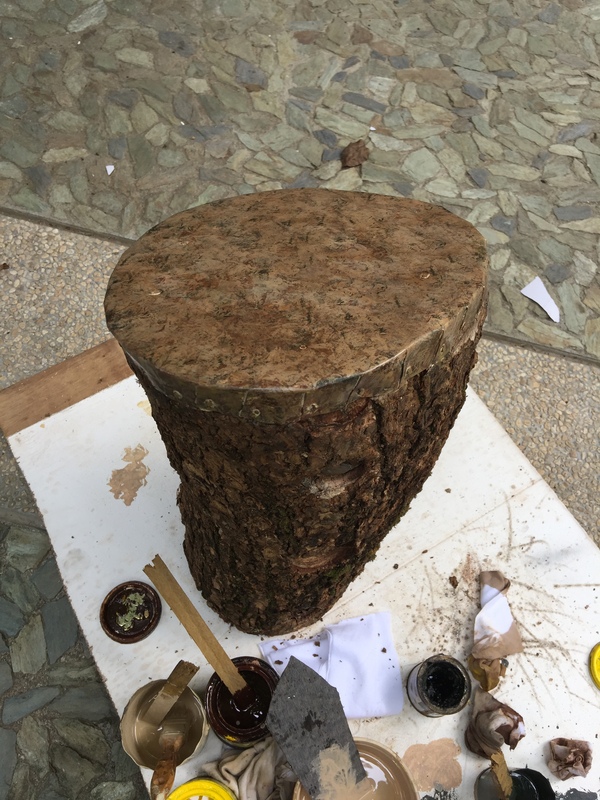 This was a good opportunity for us to copy the design of a successful project in South Africa where they made artificial nests for Ground-Hornbills out of hollowed out eucalyptus logs. They installed 29 artificial nests. 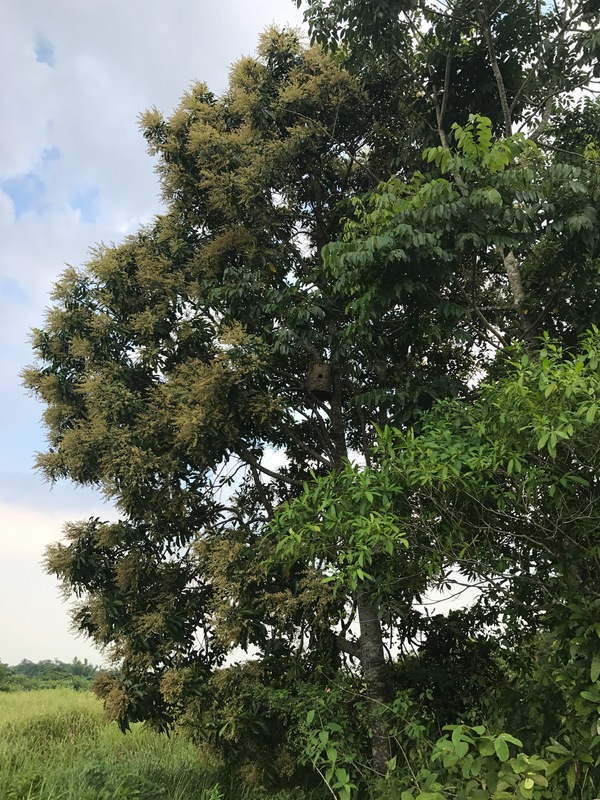 The hornbills started using the nests immediately. After two years 21 of the artificial nests were being used! There were only 6 natural nests being used in their area. They recorded the temperatures inside the artificial nests and natural nests. They found that the interiors of the natural nests reached much higher temperatures than the temperatures inside the artificial nests. They think that heat stress contributes to breeding failure. The temperatures inside the artificial nests were more steady and they think that may be one of the reasons why the artificial nests were so successful. 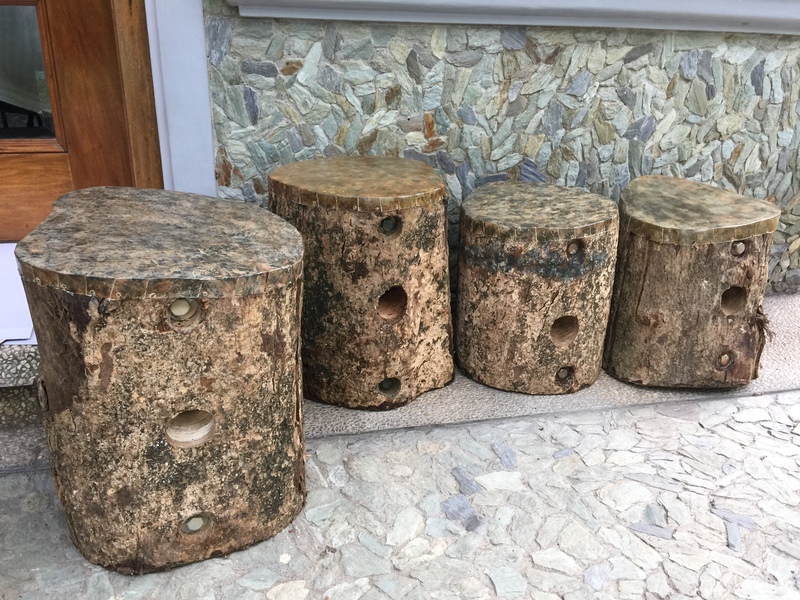 How do you build an artificial nest box out of logs? These are some of the pieces of wood that we collected. We hired people with real woodworking skills (not us!) to cut the logs in half, then hollow out the inside. Then they made a hole on one side. The two sides are bolted together. 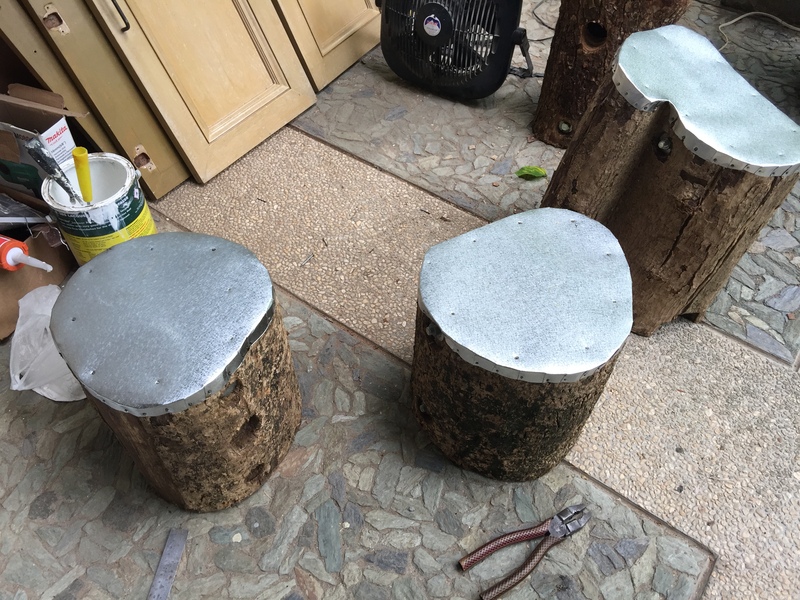 Galvanized steel topper that we hope will prevent the wood from rotting and swelling. Surprise! 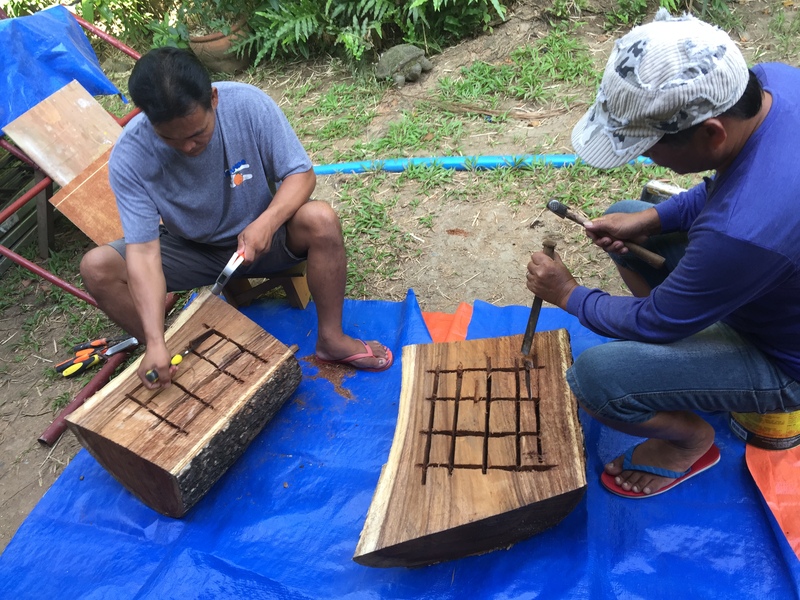 The craftspeople painted the tops to match the trunks! The finished products, ready to install! What does it look like? Are the birds using it? We installed 4 artificial nest boxes at the farm. We placed them in the areas where we have heard Scops Owls. It’s still early days, so no action at the nests yet. If I were a Scops Owl, I would nest here! How do you maintain an artificial nest box? The downside of our design is that it will be challenging to clean out! The nest boxes of the South African project have removable tops. I think this is where they access the nests to check on the chicks and do maintenance work. The tops of our nest boxes are fixed. We are told that we should clean out the nest boxes after every nesting season. This is mainly to remove parasite populations that can build up inside the nesting box. I think the nest boxes are small enough to easily take down wash out. We could vacuum it if there’s such a thing as a battery operated Shop Vac! The wire that holds up the nests will also need adjusting as the tree grows. We are also going to try other designs. 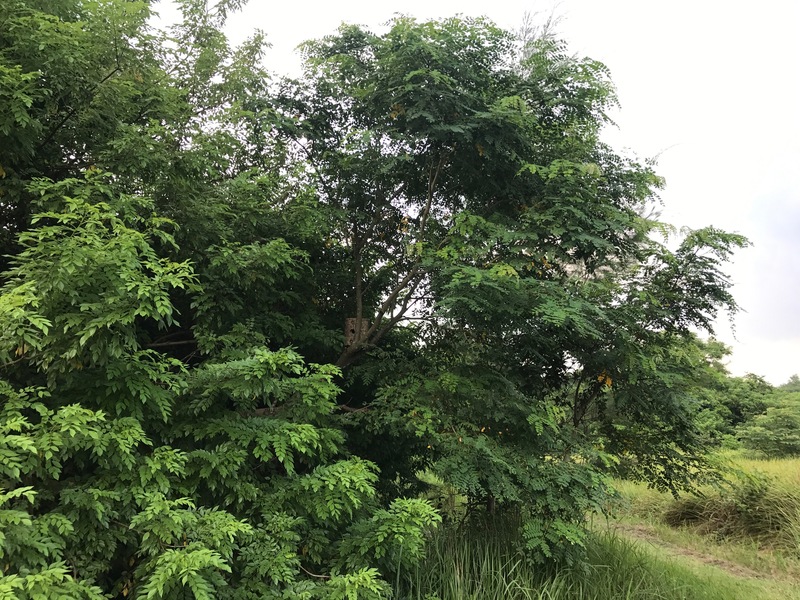 There’s a successful nesting project in Bacong, Negros Oriental that uses a very simple and open design. It looked so simple that I found it hard to believe that it would work! Now I’m thinking that one advantage of a very open front is that the heat won’t build up too much inside. I also saw an intriguing design from the US that has a small mirror so you can check the inside of the nesting box with binoculars from the ground! We are crossing our fingers that the owls or other birds like the nest boxes! Good luck! I hope the owls discover your nesting boxes soon. Sylvia, I am interested to see your nestbox work! Yes, there are Li-ion powered mini vacuum cleaners. I have one that I bought for vacuuming up small insects on hedgerows for study (they are unharmed). Looking inside the nests: you can get a cellphone attachment of an endoscope that should work. Hi Des, thanks for the tips! I don’t know about the proper sizes of nesting holes. I’m thinking bigger is better?? We had a strange incident where we saw a Coppersmith Barbet stuck headfirst in a hole. So sad, it eventually died. Next Next post: Bird Fight!